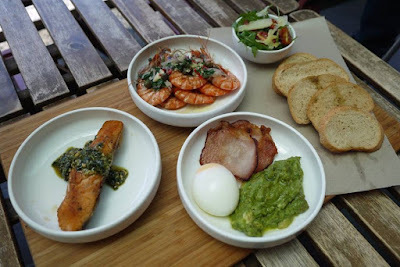 We have chosen Garlic butter prawn, guacamole bacon with soft boil egg, Grilled salmon with basil cashew pesto to make it a tapas platter. The prawn and salmon were fresh, and were perfect to start off with. This breakfast combo is full of nutrition and absolutely delicious too. 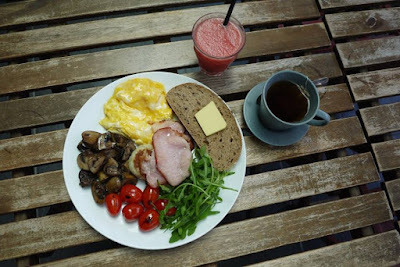 This traditional English breakfast is great for everyone, the bacon was crisp and not greasy, the mashed potato was so delicious and the sautéed mushroom. 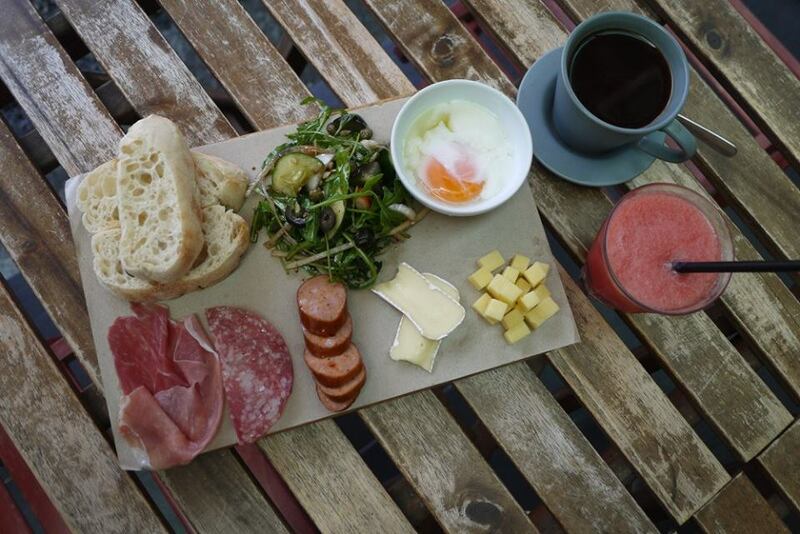 The best part is, all the breakfast at BreadFruits comes with coffee or tea and juice of the day, so worth it. Antipesto Breakfast Platter at Breadfruits is beautiful to look at and absolutely delicious. Various rich cheeses, marinated vegetables, salad and half boiled egg served on a chalkboard plate, we thought that it is best paired with red/white wine. 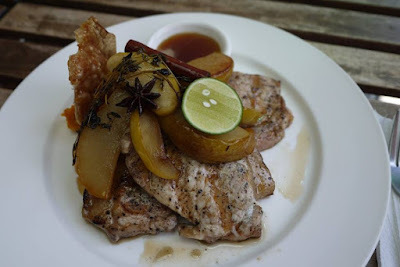 The Wild Honey Pork Chop at Breadfruits was so tasty, juicy and flavourful. Served with caramelized apple pear, pumpkin corn mash, wild honey and thyme, it taste amazingly delicious. 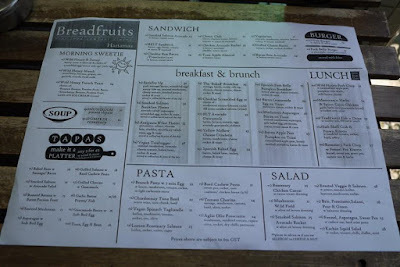 No wonder it is one of BreadFruits' best sellers, we would definitely go back for more and we would strongly recommend this to you all. Pork Belly Burger at Breadfruits is served with pineapple, carrot and cucumber, it is a great choice for pork lover. 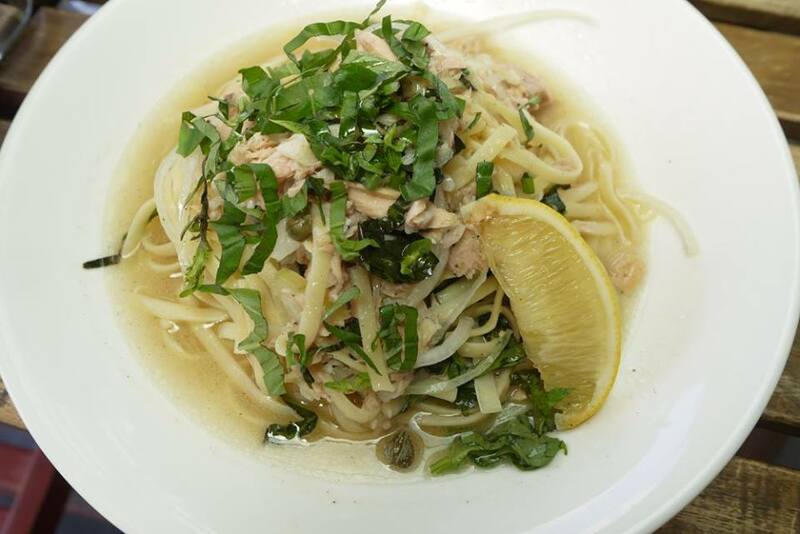 Chardonnay Tuna Basil Pasta is cooked with white wine, tuna chunk and basil. I am not a big fan of pasta but this pasta taste alright. I guess tuna lovers would be happy with it. BreadFruits @ Desa Sri Hartamas has now becomes one of our favourite out of the many breakfast places. Loving the small and cozy restaurant that provides quick, hearty portions and good pricing. My, what a scrumptious brunch this is. 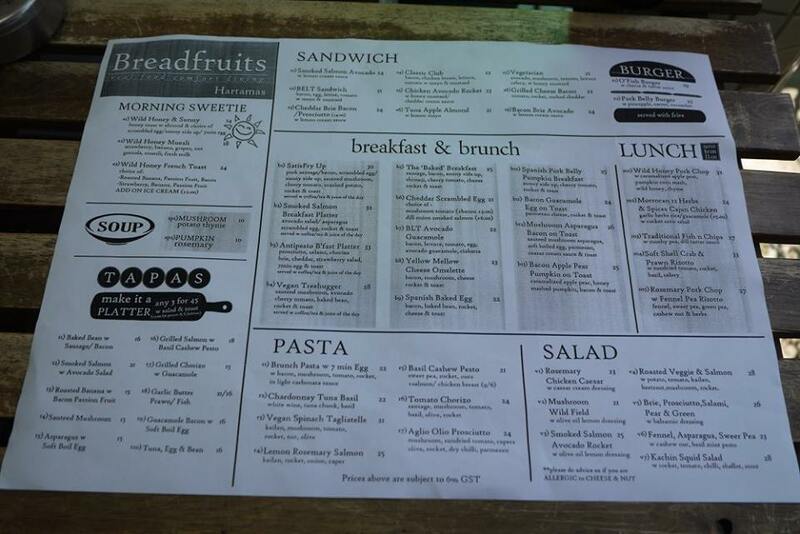 I have not heard of BreadFruits before. I must be living in a cave! Desa Sri Hartamas? 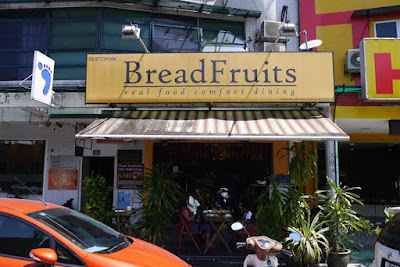 I know a bunch of my friends who will be very happy that Breadfruits is nearby to their usual hangout. Thanks for the write-up. The shop name is rather misleading but oh wow the food they serve there.. Would love to try it one day! such a great combination and presentation of the food! i would love to try it too. 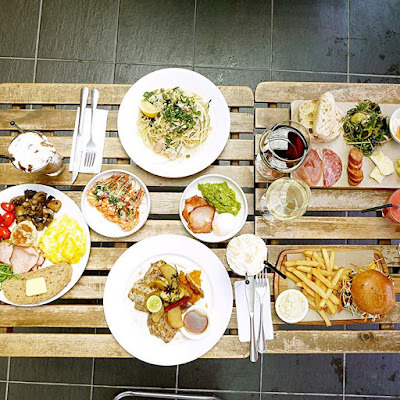 food looks good. 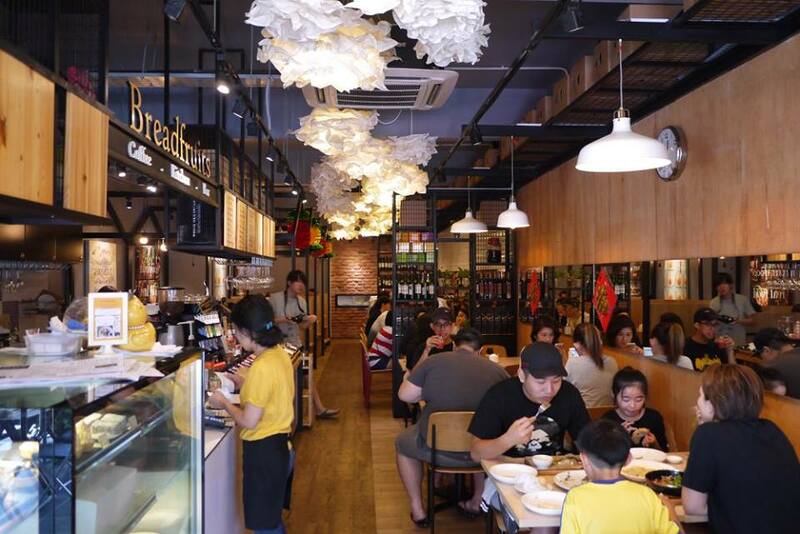 Hope you enjoyed your dining experience with your fanily :D hope to try! I am a huge pasta fan and had never had tuna pasta before. I would love to try that with a fresh cup of juice of the day. I love Breadfruit and miss it so much! Food is always good there, even after all these years! Wow these are my fave breakfast setting! I could stay for longer hours here for breakfast. 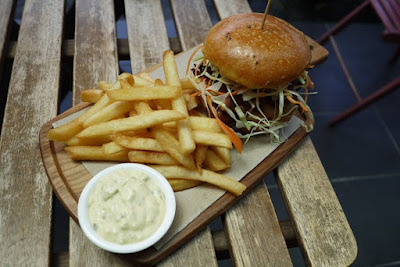 Looks yummylicious! !